Safety is one of the highest priorities when dividing a large room into individual work areas. 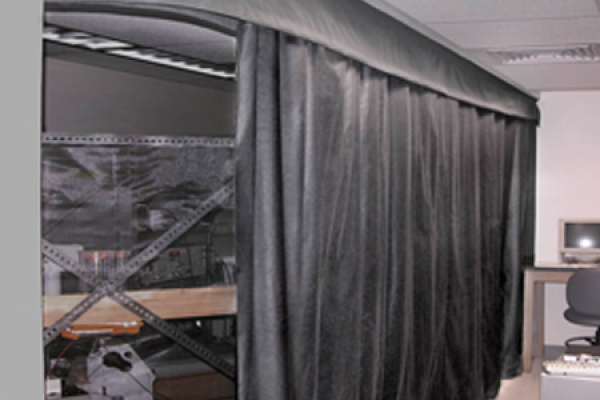 PL Systems Inc. curtains use a Modacrylic material as a major percentage of the curtain content. In addition to Modacrylic Self Extinguishing Fabric, SEF, (38%), our curtains contain Saran Flat Monofilament, (30%) for curtain strength, Viscose Rayon (26%) for softness and Polyester (6%) to prevent wrinkles. The back side of the curtain made of vinyl to prevent light penetration. The properties of this material lend itself as an ideal product to be used in many Laboratories such as Laser Labs Class I-IV Darkroom/Blackout applications, Infra-Red, Ultra-Violet Measurement, Gene Separation Silver Halide and many others. 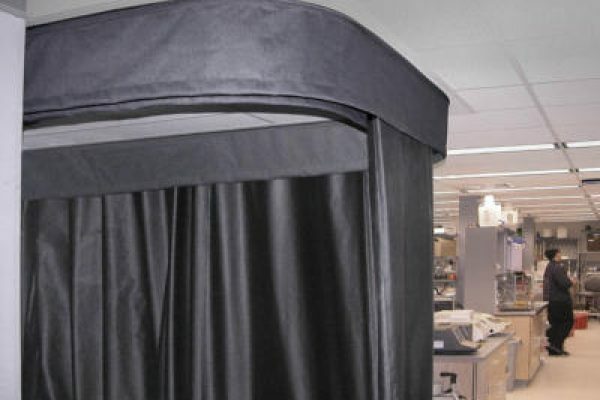 Curtain Material is inherently & permanently flame resistant and is composed of 38% *SEF Modacrylic, 30% Saran Flat Monofilament, 26% Viscose Rayon and 6% Polyester. The material also has a double-vinyl Black color laminated back for opacity (samples are available upon request). This fabric passes the flame resistance requirements specified by the State of California test – Registration # FA-40602, and in accordance with the National Fire Protection Association Standard No. 701-99 test methods 1 and 2 and Provide Test Report based on ASTM E 84. Double-coated Vinyl cloth will not be acceptable as an equal. The laser curtain shall afford the required level of protection from direct and diffusely scattered laser light generated by Class IV lasers. The threshold limit for the beam penetration through the curtain at the minimum distance indicated on the drawings shall not be exceeded for an exposure time of 60 seconds. No part of the installation shall be flammable or support combustion. No part of the installation shall release toxic fumes following a laser exposure. The system shall meet the ANSI Z136.1 Safe Use of Lasers. 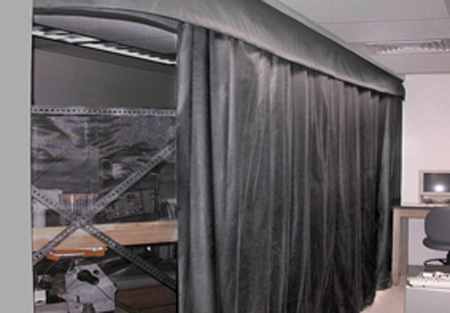 Curtain is custom designed to the width of the opening permitting movement of curtains in either direction of the track. 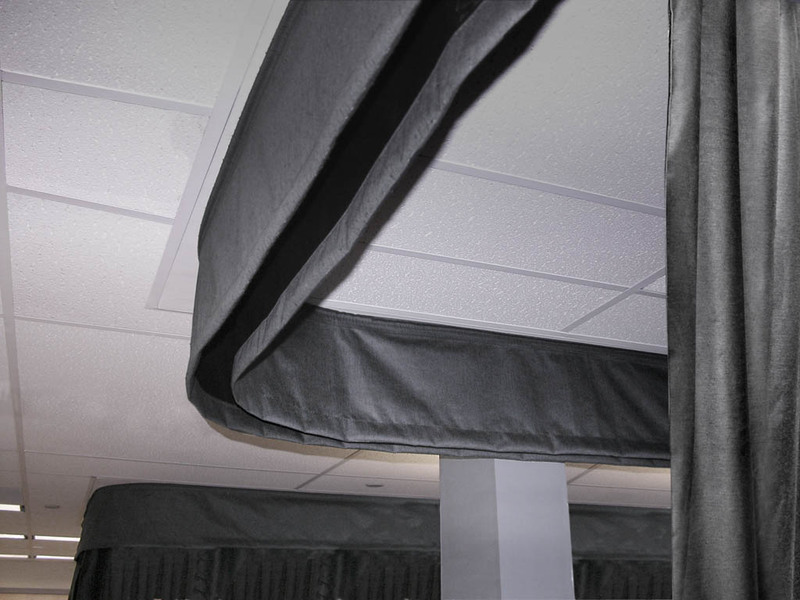 The outside vertical edges of each curtain are supplied with “Velcro” quick seal strips to facilitate “light-trap” overlaps for easy attachment to walls. The curtain panel shall be sewn flat plus 10% fullness. The seams shall be sewn French-style (No raw edges visible). The top of the curtain shall have grommets on 8″ centers. The bottom edge shall be weighted and overlap with floor approximately 2” to maintain a light tight environment. Valance curtain section supplied with front and rear light-trap. 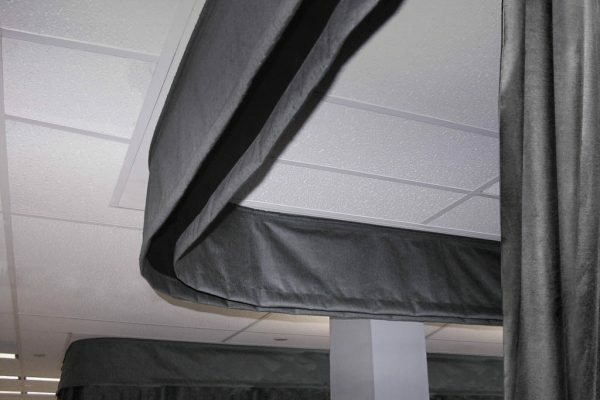 The valances shall be a height of 11 inches made of the same as the curtain material with a sewn-on Velcro strip and shall be designed to be mounted to the curtain track assembly. Track The track is constructed of satin anodized aluminum designed for surface mounting, and to the underside of the ceiling. The track is extruded aluminum box-channel 1-1/4″ x 7/8″ slotted on the underside to receive two-wheeled carriers. The track also serves as an integral part of the valance assembly. Fastening should be made not more than 18″ on centers. Corners, where required, are supplied as one piece, 12″ radius 90-degree track sections. Tracks are supplied, as required, with hook carriers, end caps, snap-outs, and connectors, of the sleeve type. The hooks are formed of rustproof wire riding in a carrier with non-wearing nylon wheels. Installation fastenings, bracing and grounds are not supplied and are the responsibility of the customer. Grounds to support 50lbs per linear foot. Curtain Warranty PL Systems Inc. warrants to the original purchaser that all curtain material shall be free of defects in workmanship and material for Five (5) years from date of installation acceptance. 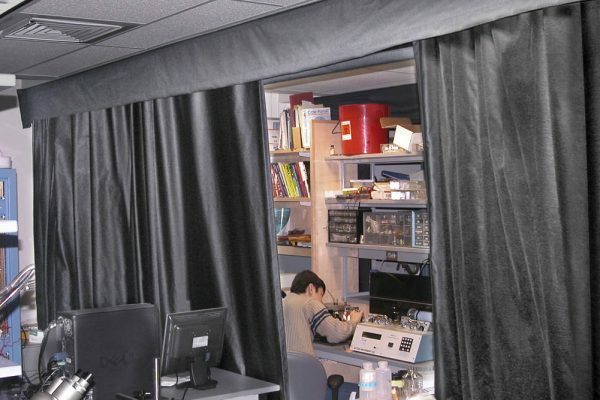 Double Curtains are custom designed as two curtains with an overlap of two feet at the separation (Entrance/Exit) point, making it light tight and permitting movement of curtains in either direction of the track. Both tracks run side-by-side or as close to the radius (if applicable) as possible. 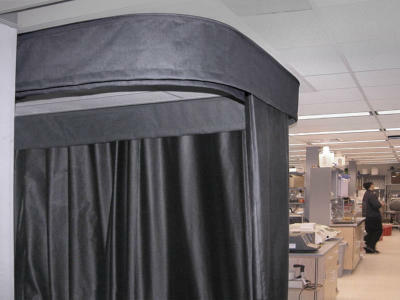 The outside vertical edges of each curtain are supplied with “Velcro” quick seal strips to facilitate “light-trap” overlaps for easy attachment to walls. The curtain panel shall be sewn flat plus 10% fullness. The seams shall be sewn French-style (No raw edges visible). The top of the curtain shall have grommets on 8″ centers. The bottom edge shall be weighted and overlap with floor approximately 2”. Track The double track (two in parallel) is constructed of satin anodized aluminum designed for surface mounting, and to the underside of the ceiling. The track is extruded aluminum box-channel 1-1/4″ x 7/8″ slotted on the underside to receive two-wheeled carriers. The track also serves as an integral part of the valance assembly. Fastening should be made not more than 18″ on centers. Corners, where required, are supplied as one piece, 12″ radius 90-degree track sections. Tracks are supplied, as required, with hook carriers, end caps, snap-outs, and connectors, of the sleeve type. The hooks are formed of rustproof wire riding in a carrier with non-wearing nylon wheels..
What would you like samples of? Wherever a strong Laser is stored or used, safety is always a concern. Fortunately, posting signs about Laser hazards reminds everyone in your facility to use proper protective gear and/or follow established safety procedures. Laser safety signs can help prevent costly injuries and downtime. They’re available in a variety of headers, formats and materials. 7x5 in.10x7 in.14x10 in.20x14 in.28x20 in. © 2019 PL Systems. All rights reserved.